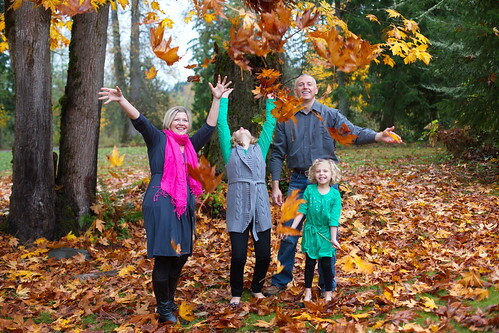 Falling leaves, a photo by The Bacher Family on Flickr. Here again is an idea inspired by the kids! They wanted to scoop up big handfuls of leaves, so I said "go ahead and do it, and everybody throw them up in the air at the same time!" It took about three tries to get it just right -- for one thing, when the leaves fall too far, there's always one in front of somebody's face -- and it took some experimentation to get the shutter speed right. But the end result is awesome!